This is the poor mans Champagne - forget Prosecco and Cava, this is the good stuff. At €3.99 a bottle and only 5% alc. we can drink 5 times the volume and not have to flee the country when the visa bill arrives. Longueville Cidre, Vintage '96 is something similar to Aspalls in style maybe a little drier with more fresh apple aromas and less floral notes. This is not a Bulmers/Druids/Strongbow cider. Produced in Normandy - the home and birthplace of dry elegant ciders and Calvados (apple brandy, a serious favourite of mine). Within the Cider producing areas of Northern France 50 apple varieties are permitted for the production of this fermented apple juice. 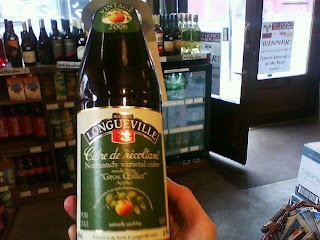 Longueville uses a single variety and produces this in a very authentic style. The nose is fresh juicy semi-sweet apples and the palate displays the same qualities but with a balanced tartness and lovely effervescence. Opened a bottle in the shop on Saturday and reformed loads of anti-cider drinkers. Most of which didn't know what they were drinking initially. Good to drink right the way through the summer but also an ideal accompaniment to boring roast pork on a rainy Autumn Sunday.